As the children left home and retirement drew near we knew that we had to move away from the go fast(er) PASSAGE and into the boat that would meet our needs for the next 20 plus years. The initial plan was to buy a vessel that was capable of an Atlantic crossing. Paul has three brothers in Ireland who are all boaters and were interested in a crossing, so long as we had the boat capable of doing it safely. So we narrowed it down to a Nordhavn. 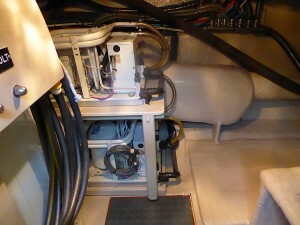 We went on board many of them, watched the PAE brokerage site and James Knight’s Yacht Tech site. However as the time drew closer to making the call and pulling the trigger we sat back and asked the big question – were we willing to sink that kind of money into a depreciating asset, with the main reason being the completion of an Atlantic crossing that may or may not come off, and the prospect of paying tens of thousands of dollars to have it shipped back from Europe. We landed on “no.” We laid out our needs and wants in a boat, and set a price target. Low HP single diesel engine for fuel economy. Large fuel capability for distance, and reduced risk of low quality fuel in foreign ports. Full displacement for for comfortable sea handling. Over forty feet, preferably over 43 feet. 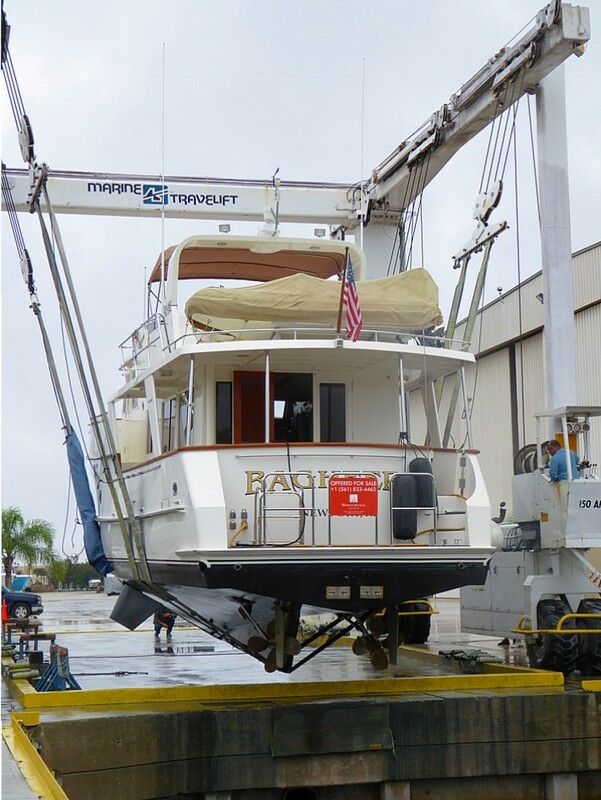 Raised pilothouse, preferably with a day-bed. Flybridge with space for entertaining. 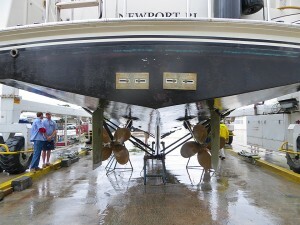 Bow thruster (stern thruster as well if we could get it). Good size engine room with easy access from both the engine room and salon. Comfortable for a cruising couple with regular (as opposed to occasional guests). 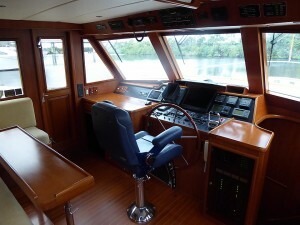 Queen cabin and either a queens guest cabin or easily accessible berths in twin cabin. Essential given that we and our family and friends are not growing any younger! Two heads. Good size salon comfortable for extended periods aboard. Cockpit configuration with easy access from a swim platform and side doors so that our dog would not have to be lifted up a high transom. Critical given the age of the dog and the age of her owners. Washer and dryer, or good free location to add the, again with extended periods aboard in mind. Finally, but maybe most important, a boat in better than good condition. Without going into all the miserable detail we drove from Jacksonville to Southport NC and back (15 hours) to spend 30 minutes on a boat the broker guaranteed was pristine. It was a mess with 12 inch weed hanging from the hull, water intrusion damaging a lot of the interior woodwork and an engine room that was filthy! We drove to Fort Myers and saw a boat that we thought was it. Put in and negotiated an offer. Did the boat survey, sea trial, haul out, and engine survey (thousands of dollars down the toilet) during which one engine quit, the electronic fuses blew every time we tried to turn something on, and we found that the boat had zero paint on the bottom and the epoxy had been eaten through to the gelcoat. Plus a myriad of other issues. 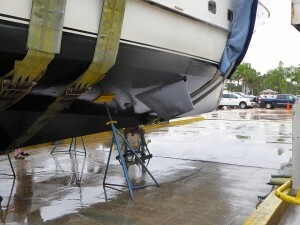 We had estimates for the work as we did like the boat, but the buyer was not willing to come to where we wanted to be. So we walked. Which I have to tell you, is hard to do after sinking money into the surveys. So we went back to the drawing board. Then this Grand Alaskan 53 came onto the market. It was above our planned price point, but not horribly so. So off we went to Stuart one Saturday with our broker and looked at her as well as another boat that had caught our eye. We thought she was beautiful. Checked a lot of the boxes, and seemed to have been well looked after. We decided to put in an offer. 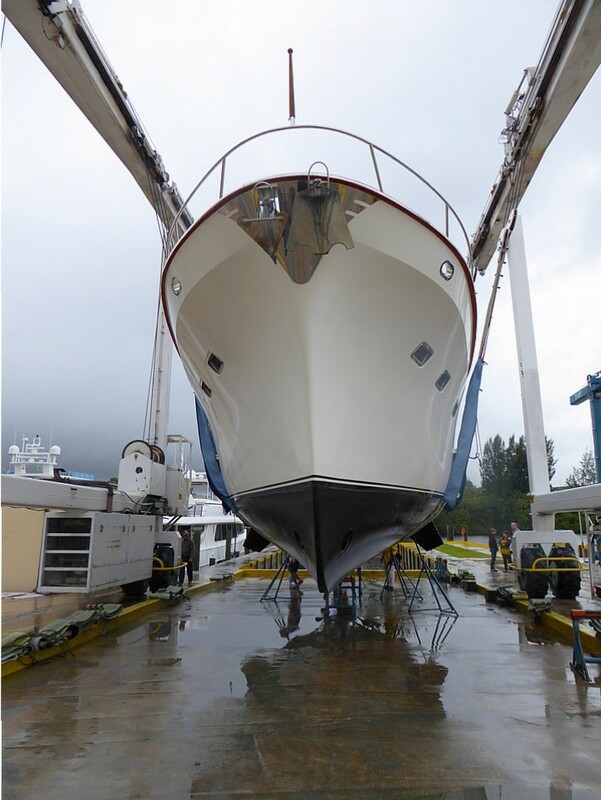 After some back and forth we landed at a price we were happy with and we believed was fair for the seller who, it was clear from the vessel condition, had loved her as well. 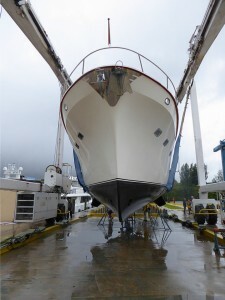 We arranged for a boat survey and haul out, and engine survey. The day was miserable. Poured with rain all day and howled with wind. 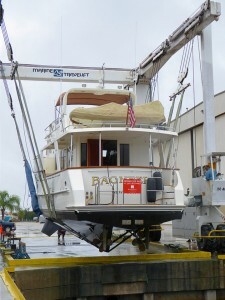 Luckily the boat was berthed in the St Lucie River and sheltered. As the surveys progressed we learned that, to our surprise, there were a number of issues. We decided to wait until we got the written surveys before we made a decision on what to do next. As always, there were a couple of dozen items on the surveys. Most we were comfortable with, and some others, though they would need money spent, didn’t worry us – like some blisters, a potential failed stabilizer seal, loose cutlass bearing, fuel lines needing replaced etc. etc. The biggest concerns were in two areas. 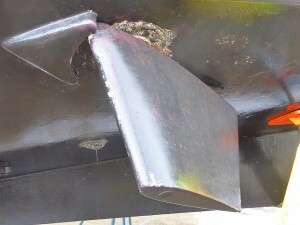 The fiberglass exhaust tubes that run through the rear of the boat showed some salt crusting, indicating that here were cracks in the tubes. These would need investigated and potentially ground down and rebuilt. The generator had multiple potential issues. The biggest were that the rear main seal was leaking oil and the generator was losing RPMs and hertz when a load was applied. Given that this is a substantial 16KW Northern Lights genset, this was worrying. We thought for some time, talked with our broker, and decided that, if the sellers were reasonable with negotiating a lowering of the offer, that we would proceed. We realized that we would be taking on a level of risk since both the exhaust tube work and generator could be expensive. Without going into all of the details, we ended up at a place where we felt the risk to us was minimized enough that we could move forward. We updated the contract and set a settlement date of February 11th 2016, at which time SONAS (her new name) would be ours. So how many of the Needs and Wants did she check off. Click here to find out SONAS.